The alewives are continuing to climb the fishway, with 30 more fish counted last week! This keeps on a par with last year’s count, but still well behind that of 2014. 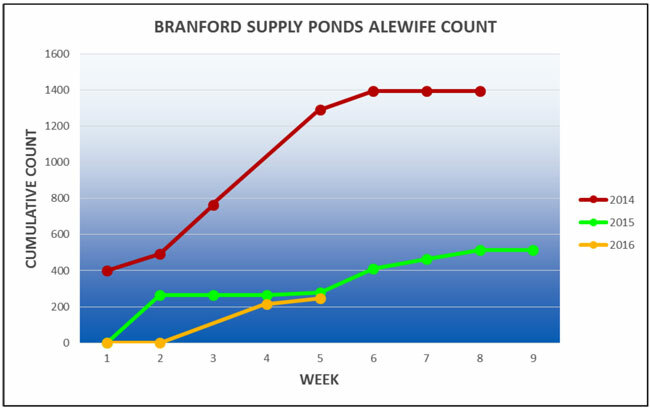 Branford is not unusual, and alewife numbers around the state are still pretty low. Water temperatures remain rather low for this time of year, and this keeps the alewives away. The largest numbers were reported in the Salmon River near East Haddam. Perhaps as the weather and water temperatures continue to warm, we will see increased numbers at the Supply Ponds.